"When people come visit Los Angeles and ask what I like to do, I say, 'Let me take you to this great spot.' It's free, you can learn so much about the city from the views and all of the displays are so interactive. 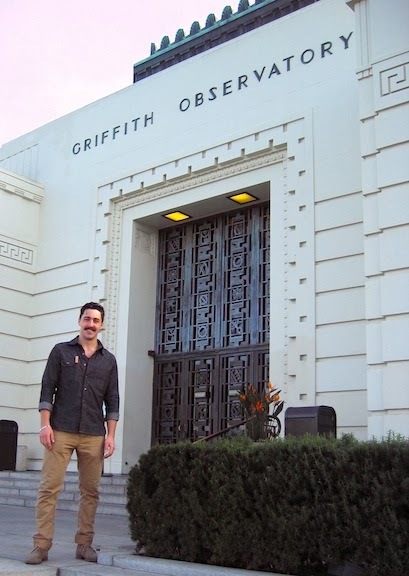 I just love it," gushes actor David Flannery as we begin our walk through his favorite L.A. place, Griffith Observatory. "This Our Sun Is a Star exhibit is great. Can you imagine, the sun is that big? We are just a little blip in the universe; it's pretty amazing." He can hardly contain his enthusiasm as we continue through the Ahmanson Hall of the Sky. His wonderment reminds me of the story about how the location came to be: Industrialist and philanthropist Griffith J. Griffith dreamt up the idea of a public observatory while peering at the sky through the Mount Wilson telescope in 1904. Griffith's vision for making astronomy accessible to the general population wasn't realized until after his death when Griffith Observatory opened in 1935, yet it succeeds in awing multitudes of visitors to this day and has become an L.A. landmark, symbolizing the city in films like Dragnet, The People vs. Larry Flynt and Transformers. David Flannery is himself a rising L.A. star. In the five years since relocating from Boise, Idaho, he has nabbed roles in "The Bold and the Beautiful," Taylor Swift's music video for "Mean" and A Single Shot with Sam Rockwell, Jeffrey Wright and Kelly Reilly. His most recent part is in William H. Macy's feature-length, directorial debut, Rudderless, alongside Billy Crudup, Selena Gomez, Anton Yelchin and Laurence Fishburne. He tells me a little about his childhood and the path that led him to Hollywood as we travel down the Cosmic Connection, a corridor in the observatory that's lined with a glass case housing celestial-themed jewelry. "Science was huge for me growing up, but I was mainly into sports. I played football. I didn't do theater because that's not what the cool kids did," he confesses with a laugh. "I was a closet nerd, in all these AP classes, but I would try to hide it from everybody. Then, I would go home and play Magic: The Gathering cards and be really nerdy. It was my deep, dark secret. It sounds so funny now, why was I so embarrassed? All these idiosyncrasies are what make a person a person, after all." David loved science so much that he was actually going to study biology in college before deciding to move out to Los Angeles to pursue acting. "My grandma instilled in my head that I needed to go to school and become a doctor, so that's what I felt I had to do to make her happy. When she passed away, a lot of stuff took place in my life, one event after another, and I moved to Los Angeles," he recalls. "It was just the right time." We come to the Edge of Space Mezzanine, where David is able to let his inner science nerd run rampant, touching all the meteorite samples, and he informs me that we're approaching his favorite part of the observatory, the Gunther Depths of Space. "I have this whole system of taking people through this area. I usually like to start at the moon and then go down to the planet exhibits," he says. "The first few times I came the observatory, I only stayed upstairs but when I finally came down here I thought it was so cool because you can stand on these scales and see how much you weigh on each planet, read all of the information and look into the scopes at actual 3-D images of places like Mars. We get to be hands-on with the exhibits here, and that's really what I love about it." We head outside for what David calls "some of the greatest views in the city" and come upon the Rebel Without a Cause monument, a bust of James Dean, who was the lead actor in the 1955 film that Griffith Observatory was featured in. When I ask if David has seen the film, he replies, "I actually own it. It's a cool movie, but I like East of Eden more. I love the camera angles they use, and there's not much dialogue in it – kind of like Drive where it's more of a visual thing. You look into the characters' eyes and feel like there's no need for words." In fact, one of David's all-time favorite movie characters had very few lines at all. "Ever since I was a kid I wanted to be an actor, and it was because of Terminator 2: Judgment Day, which I probably shouldn't have been watching as a kid," he laughs. "But I did, and I fell in love with Arnold Schwarzenegger's character, the Terminator. He got to play this machine character. I also loved all the action." While he has mainly acted in character-driven pieces, like A Single Shot and Rudderless, David still harbors a love for good action movies. "I just saw the new RoboCop and I loved it. The action sequences and how they redid it from the original, it reminded me of Terminator 2," he admits. "Gary Oldman was awesome in it. I would absolutely love to do a bang-em-up action movie. Those kind of movies are just fun. I really love to sink my teeth into a character, get a handle of the script and become a character, but when you're in an action movie you get to jump and roll around, your blood's pumping. Not to say you can't do that in a drama because god knows there have been times when my heart's beating fast staring into the eyes of a beautiful woman." Although Rudderless' storyline is quite somber, David did manage to have a fun time filming this particular picture. "William H. Macy is one of the coolest guys I've ever worked with for the fact that he really understands actors because he has been acting for so long, and he had such a great time directing. He didn't treat it like a job, he treated it like a passion, and I loved that about him," he tells. "There was so much enthusiasm when he came on set, and he was like a kid in a candy store the whole time that it was such a pleasure to work with him. The simple fact that I got to work with him in that capacity was amazing." Rudderless made its Sundance debut as the festival's closing night selection in January, and David had a wonderful experience in Park City. "It was my second time going but my first time having a film there so, in that capacity, it was awesome. Last year, I was on the outside looking in, whereas this year, I was actually in a film, and it was exciting to experience it from the inside," he says. "It's a sleepy little town the rest of the year, but when Sundance goes on, it blows up and everybody has a great time." In the film, Billy Crudup is a former high-profile advertising executive, Sam, whose life is turned upside down at the tragic death of his son, whom David plays a college mate of. Sam discovers demos and lyrics his son had created and learns to play each song. He captures the ear of a young musician (Anton Yelchin) while playing one of the songs at a local bar, and through the band the duo creates, comes healing. Music plays a big role in Rudderless, and holds a lot of meaning in David's life as well. "Rudderless is definitely a story that hasn't been told before, and they do it in such a way that you feel compassion for what these people are going through. The music really helps and is absolutely amazing. They got a standing ovation in the theater at Sundance for the last song they played, which was fantastic. It was the first time I had seen the film, and it just blew me away. I took my sister, and she was in tears," he remembers. "I find music to be a huge inspiration to me, especially when I'm going over lines. I put on music, and it helps my mind get away from totally intellectualizing everything, to let creativity just flow. Reading a script is like conducting a symphony, you have your ups and downs." David taught himself to play the guitar and sings a bit ("Well, I sing a lot, just not in front of people," he laughs."). He even took some guitar lessons at the Silverlake Conservatory of Music near his home in Silver Lake. "The teachers at the Conservatory are so passionate about their craft, they really want you to learn," he says. Music also has a part in the Griffith Observatory's history. From 1973-2002, its planetarium hosted the Laserium laser show, where lights would be set to the songs of Pink Floyd and Led Zeppelin. Aside from playing his guitar, David loves to write poetry. While he admires the work of writers such as Maya Angelou, he mainly likes to pen his own pieces rather than read others' poems. "Poetry is feeling in some of its truest form when you write. I like to write and let the person whom I give the poem to feel it and come up with their own idea about it. I've had people ask me, 'What does this mean?' I say, 'What do you think it means? I wrote it for you.'" When he's not writing poems, you could probably find David collaborating with his screenwriting partner, Josh Winot, or sitting at one of his favorite cafés, Intelligentsia. "I usually get an Angeleno, which is four shots of espresso [with milk and agave]. It really gets you going, but it's delicious, too," he informs. "Intelligentsia has some of the greatest chai lattes that you can get. I don't know what they do to their mix, but they're pretty amazing." While he's not a vegan or vegetarian, he highly recommends Sage Vegan Bistro in Echo Park for their KindKreme ice cream. He is a big salad lover, especially Cobb Salad, and when I tell him that the Cobb Salad was created in Los Angeles, at the Hollywood Brown Derby where it was named for co-owner Robert Cobb, he's floored. Griffith Observatory and Griffith Park, however, overall hold the most special place in David's heart. "The first time I came to Griffith Park, my friend took me on this great hike through the trails. I fell in love with it and started doing that trail all the time. There's a great hike off to left of the Hollywood Sign. You go along the fence, climb over some rocks to that lone tree, and there's a box you can sign your name on," he says, pointing out the exact tree on the hillside. "I used to walk dogs for some cash, and when I started taking them here, I just became addicted. Every single day I would walk the dogs I would take them here, and they fell in love just as much as I did. I miss that a lot, getting exercise as you're hanging out with animals and forming a bond." Don't get him wrong, though. Even when the entertainment industry gets overwhelming, he really couldn't see himself doing anything else in the world other than acting. As for Los Angeles, he has a love/hate relationship with the city. "It's funny, I love the town but always feel like I need to get away to San Diego or Santa Barbara. When I come back, I have this great feeling like there's something magical about this city. There's this great energy here, and it can be as positive or negative as you want," he states. "That's what the joy of L.A. is – it is what you make of it. There really is something magical here. I mean, look at this view." The amazing views from Griffith Observatory really are breathtaking. As we drive down the hillside from the observatory into Griffith Park we see a group of coyotes and deer sitting in a meadow next to the Greek Theatre. It's like a scene out of a nature documentary, and the site takes me back to one of the most important lessons that David says he's learned about life lately. "Never complain. Life is going to give you things, but it's not going to give you anything that you can't handle so you just have to go with it. Why sit there and complain about it? There are so many gifts that this city has to offer you if you just take it," he says. "Don't complain, because there are so many people out there who don't have what you have or aren't able to experience these things. Let it go, and just let it flow." For more information, visit davidadamflannery.com.